In the original title of my previous post, I asked, does one of the ‘recently excavated Palmyrene statues’ have six fingers? In a somewhat unexpected turn of events, some people seem to have (mis)understood it as a denial of the existence of polydactyly (where people have more than five digits on one or more of their hands and/or feet). People are right to observe that polydactyly (in toes as well as fingers) occurs in Syria and around the Levant, further afield in Iraq, in fact everywhere from Brazil to India. I don’t know of any studies, but polydactyly may indeed be under-represented in the statue population. At least a few people had a little more fun. Nonetheless, I was not denying the existence of polydactyly (or indeed ectrodactyly, where people have fewer than five digits on one or more of their hands and/or feet). Apart from the uncharacteristic expression on the face and adornment in the clothing, the left hand of the sculpture on the left is just wrong. To address the possibility in terms of style, the last two fingers of a hand are sometimes sculpted together, as can be seen in both of the hands of the sculpture on the right. If this was a portrait of a polydactylous person, the fifth and sixth fingers would be sculpted together, not the fourth and fifth. Yet the left hand of the sculpture on the left is simply terribly made. There is a strange oval hole where the wrist meets the tunic. The palm of the right hand of the sculpture on the right is significantly narrower than the face is wide, whereas the palm of the left hand of the sculpture on the left is almost as broad as the face is wide. The tube-like fingers of the left hand of the sculpture on the left, on their own, are longer than the face is wide. The hand is so poorly made that it is difficult to tell whether there even is a sixth finger or whether the bloated palm simply encompasses some of the space around the fingers. I could have done better – and I gave up and stopped doing art at school when I was fourteen. We know that the Islamic State’s agents use WhatsApp and its affiliates use Kik (and, realistically, all of the armed groups engage in a range of encrypted communications and transactions). Why, then, would they insist on ‘cash upfront’ for these auctions? Who set the reserve price at $150,000? The consignors? The auctioneers? Did cash-rich handlers really pay at least that much for these objects? Will the Islamic State’s consumer protection office intervene on behalf of the defrauded buyers? … or found recently buried… I would only say that the design is wrong, from the twisted lips and the geometric thing over the tunic to the disastrous hand. Today I consulted Anna Sadurska and Adnan Bounni’s “Les sculptures funéraires de Palmyre,” which contains photos of hundreds of funerary busts. 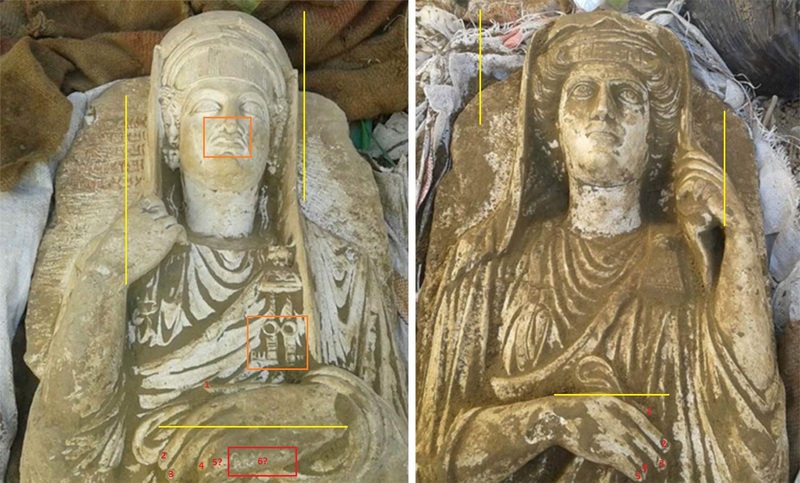 While I was unable to find either of these exact artifacts in the book, I did notice that a large number of Palmyra funerary sculptures showed similar mis-shapen proportions, extremely large hands, and low quality of workmanship in certain places. The geometric things coming off the left shoulder are heavily decorated brooch pins and are common on Palmyra reliefs. In conclusion I don’t think that either the mis-shapen proportions or the brooch are indicative of a forgery. My only question regards the seeming appearance of the letters RU on one of the busts. I suppose it is possible that it is an optical illusion created by dirt covering part of the brooch pin decoration but I’m not sure. To conclude, after looking at other examples nothing else besides that RU says “fake” to me, although they may very well still be fake. I assume the “RU” is an optical illusion. It would be an exceedingly strange feature to add to a fake. Isn’t the geometric thing a different thing from the brooch pin? For instance, there is a heavy brooch pin on the sculpture on the right, but no geometric pattern beneath. Again, I’m stuck with Google Images (or equivalent museum pages), which might be unrepresentative. But I can’t see anything like that on any of the other portraits. There are braided-looking patterns (e.g. https://commons.wikimedia.org/wiki/File:Relief_Palmyra_Petit_Palais_ADUT01909.jpg) or otherwise “natural-looking” patterns (e.g. http://www.toledomuseum.org/wordpress/wp-content/uploads/1962_18.jpg) beneath the pins, but certainly nothing that turns at a right angle. I think some of the size difference may be due to perspective. The left hand is definitely bigger than the right but not by as much as it seems. I can’t really tell if it is a right angle or just dirt? All I can say for sure is there are two tassels with rings hanging off the brooch pin, which again seems entirely typical. Hello..i have inherited 3 Palmyra funerarys but im not sure if they are real or fake. Is it possible to send you some pictures? Maybe you can help me understand the value of these objects. Thank you in advance. Please contact me at samarkeolog on gmail.